The Rush Jet will become unlocked once you have defeated at least four of the Robot Master bosses. Once unlocked Rush will appear and transform into a flying sled which Mega Man can ride, his rear legs becoming jet thrusters. The Rush Jet allows Mega Man to traverse areas quickly, without touching the ground and can also be used in mid-air. Torch Man's weakness is Tundra Man's Tundra Storm. Power Gear Tundra Storm's will defeat Torch Man in just a few hits. Tundra Man's weakness is Fuse Man's Scramble Thunder. When Mega Man uses Scramble Thunder when the Power Gear is in effect, he will fire a larger sphere that deals more damage and can pass through enemies. Fuse Man's weakness is Bounce Man's Bounce Ball. If you use your Power Gear to increase the rate of damaging Bounce Balls you send out you will quickly defeat Fuse Man. Bounce Man's weakness is Impact Man’s Pile Driver so if you can land a Pile Driver attack every time Bounce Man is on the ground you will eventually defeat him. Impact Man's weakness is Acid Man's Acid Barrier. If you activate the shield at the start of the battle and then blast him with repeated Acid Barrier shots during the course of it you will eventually defeat him. Blast Man's weakness is Torch Man's Blazing Torch. This attack can also be used to wipe out Blast Man's highly damaging bombs. Acid Man's weakness is Block Man’s Block Dropper, the bricks of which are capable of breaking Acid Man's shield. Pile Driver is Impact Man's special weapon that once Mega Man obtains he gains a special Dash ability that allows him to quickly dash over many hazards and enemies, or through them. Bounce Ball is Bounce Man's Special Weapon and after obtaining it, Mega Man can fire a volley of three bouncy balls. The Ball Bounce is particularly effective against some of the tougher foes in the game, including Press Dons and Mawverne, one of the final bosses. In the first area of Block Man's stage there is a Large Screw that is is worth 100 screws. If you keep grabbing it and exiting the level you will be able to gain enough screws to buy anything in Dr. Light's Lab before you even finish the first stage. In Mega Man 11 nearly all the items can be unlocked without having to defeat a boss. The two items that are the exception require you to defeat a single enemy which can be easily accomplished by collecting screws. If you play the game on the Newcomer setting some of the unlock requirements will be a bit easier. You get this Rush ability by default at the start of the game. When used Rush will appear and a coil platform will emerge from his body which can be ued to propel Mega Man to higher areas by jumping on the coil. As long as you have any amount of Rush Meter you will be able to summon Rush. During battle you can quickly cycle through the various weapons by using the shoulder buttons or alternately, use the right analog stick to quickly select a specific weapon. When Speed Gear is used time will slow down for Mega Man allowing him to avoid spikes and other hazards. 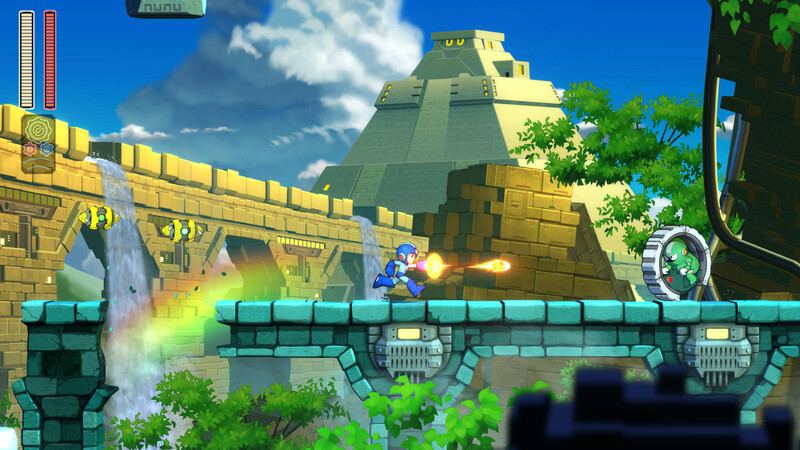 Speed Gear will also allow Mega Man to fire his weapons rapidly while enemies move in slow motion. Power Gear increases the power of Mega Man's weapons and Double Gear gives you both perks at once. When a gear is being used Mega Man starts to overheat as indicated by a gauge above him, which slowly builds up the longer he uses a gear. The gauge can be cooled down by deactivating these gears and if it overheats all Gear Systems will be lost temporarily.